MOSCOW, September 14. /TASS/. Russian President Vladimir Putin has discussed the outcome of his international meetings held on the sidelines of the Eastern Economic Forum (EEF) with the permanent members of the national Security Council, Kremlin Spokesman Dmitry Peskov said, adding that the situation in Syria and pressing domestic issues had also been touched upon. "The president told the meeting’s participants about his meetings with foreign leaders held on the sidelines of the EEF," he said. 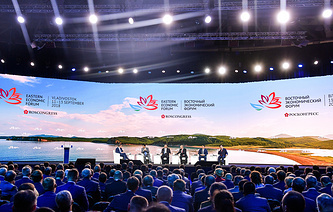 "Putin’s activities in Vladivostok were taken into account during discussions of issues related to the development of the Far East, which were focused on ways to boost the region’s economic and social development," Peskov added. "In addition, there was an exchange of views on the situation in Idlib," the Russian presidential spokesman went on to say. "The meeting’s participants expressed concern about the large number of terrorists in the region and their destabilizing activities," Peskov noted. According to him, in addition, the Russian president and the Security Council’s members discussed social and economic issues facing the country. "President Putin and other participants in the meeting also wished a happy birthday to Prime Minister Dmitry Medvedev," Peskov added. Medvedev turned 53 on Friday. Apart from Putin and Medvedev, the meeting also involved State Duma (lower house of parliament) Speaker Vyacheslav Volodin, Kremlin Administration Head Anton Vaino, Security Council Secretary Nikolai Patrushev, Defense Minister Sergei Shoigu, Interior Minister Vladimir Kolokoltsev, Foreign Intelligence Service (SVR) Director Sergei Naryshkin and Presidential Envoy for Environmental Protection, Ecology and Transport Sergei Ivanov. Putin held meetings with Chinese leader Xi Jinping, Mongolian President Khaltmaagiin Battulga, Japanese Prime Minister Shinzo Abe and South Korean Prime Minister Lee Nak-yeon during the Eastern Economic Forum held in Russia’s Far Eastern city of Vladivostok on September 11-13.